Outside the courthouse, Sabuncu called the verdict an “attack” on journalists aimed to “stop us from doing journalism in Turkey, to make us fearful when we’re doing journalism in Turkey.” He said they would continue their work even if they have to go back to prison. The defendants were previously imprisoned for 9 months, for the charges they’be only just now been convicted of, following a failed 2016 coup d’état. 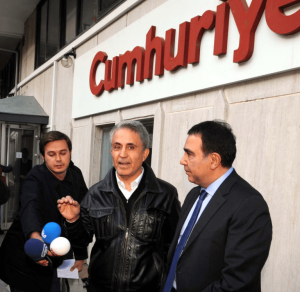 While they were arrested for supposedly supporting Kurdish militants and the Gulenist movement, there were no indictments brought for months, leaving the journalists languishing in jail without being able to see their families, or any hope of trial. Their currrent sentences range from 2 and a 1/2 – 7 and a 1/2 years. It is unclear whether their time served was taken into account. This isn’t Musa Kart’s first run in with President Erdoğan or oppression of artistic freedom. Kart has long been a critical of the President. He won the 2005 Courage in Editorial Cartooning Award from Cartoonists Rights Network International after he successfully fought a lawsuit over a cartoon depicting the then-Prime Minister as “a kitten entangled in a ball of yarn.” In 2014 he was again acquitted after Erdoğan sued over another cartoon that criticized his apparent role in a graft scandal.